Surely near the top of every Ferrari enthusiast's wish list is the gorgeous 275 GTB and 275 GTS. Ferrari showed this successor to the 250 series at the Paris Salon in 1964, and while its Colombo two-cam, 3.3-liter V-12 was familiar, its layout was new. The Ferrari 275 GTB was the first road-going Ferrari to have an independent rear suspension as well as a rear-mounted transaxle, and the car was available starting in 1965 as the 275 GTB coupe and the 275 GTS convertible – the latter having entirely different body work from the coupe. The GTBs typically had 280-hp motors while the convertibles delivered 260 hp. A six-carb, 300-hp state of tune was available in both cars as well. Some changes appeared in 1966, not the least of which was a longer nose with a slightly redesigned grille for the GTB. Shortly thereafter the 275 GTB became the 275 GTB/4, as it gained two more cams under its hood. The new spec V-12 delivered 300 hp in base trim. (It is worth noting here that the long nose was introduced prior to the four-cam engine; there are a few long nose 275 GTBs with the earlier two-cam engine). The GTB/4s were produced through 1968, and some notable options included Borrani wire wheels and aluminum bodywork on some cars. Ferrari also manufactured two special versions of the 275. 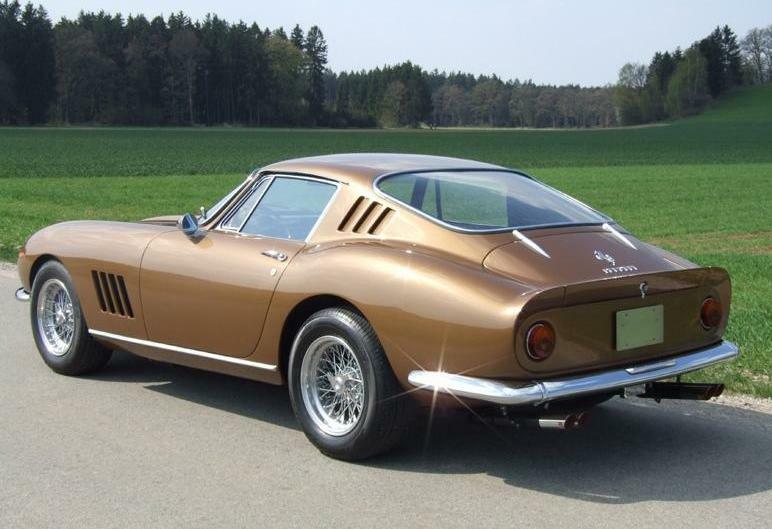 The first variant on the theme was the 275 GTB/C, which was a competition version of the coupe. Approximately 11 were built, and these all had dry sumps, a higher state of tune, a strengthened chassis, and aluminum bodywork. The second special was the 275 GTS/4 NART Spyder, of which nine were built. Commissioned by Luigi Chinetti, Jr., the NART Spyders differed from the standard Ferrari 275 GTS in that they shared most of the coachwork and lines of the 275 GTB/4 coupe as well as the four-cam motor normally associated with that car. All of the Ferrari 275s are mouth-watering collector's items, however these stunning NART Spyders continue to create frenzies whenever they appear at show or auction.